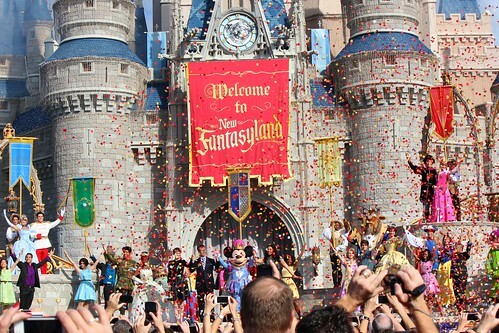 After more than five years of development and construction, the veil has been lifted at Walt Disney World. 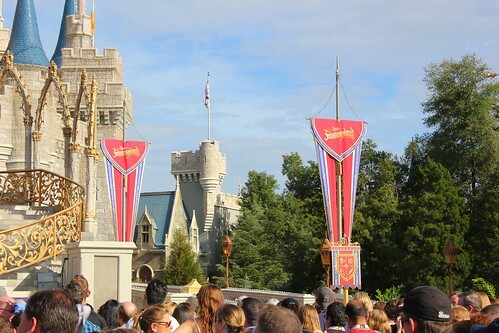 New Fantasyland is officially open at the Magic Kingdom, the theme park’s biggest-ever expansion adding a grand new restaurant, tavern, dark ride, and other enchanted experiences. 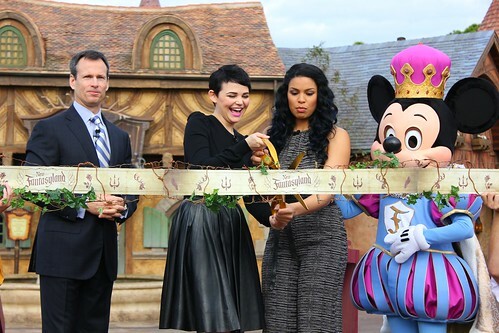 During a two-part official opening celebration this morning, Disney Parks & Resorts chairman Tom Staggs was joined by “Once Upon a Time” actress Ginnifer Goodwin and “American Idol” singer Jordin Sparks first for a small ribbon cutting outside Gaston’s Tavern in Belle’s Village for the media, then in a far grander grand opening on the Cinderella Castle forecourt stage with all park guests invited to watch. 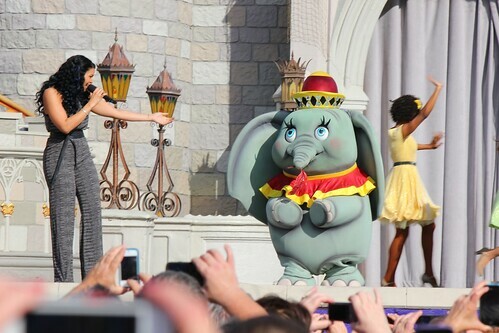 In the opening ceremony, Sparks sang a medley of classic Disney songs that relate to the debut of New Fantasyland and nearby Storybook Circus, including familiar tunes from “Beauty and the Beast,” “The Little Mermaid,” and “Dumbo” – complete with a rare character appearance by the flying elephant himself. Enjoy both ceremonies in their entirety in the videos below. Guests were packing the New Fantasyland streets after this morning’s grand opening, lining up to sample LeFou’s Brew at Gaston’s Tavern, waiting to meet Belle and familiar enchanted characters, ready to dive under the sea with Ariel, and eager to dine at the Be Our Guest restaurant. 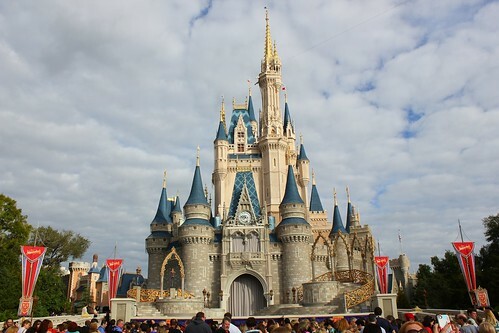 The project won’t completely wrap up until 2014, but all visitors to the Magic Kingdom beginning today can enjoy several new attractions set amidst elaborate scenery in a relaxing environment that’s been years in the making. Awesome Job Ricky!!!! I can’t wait to experience it. Amazing videos Ricky. 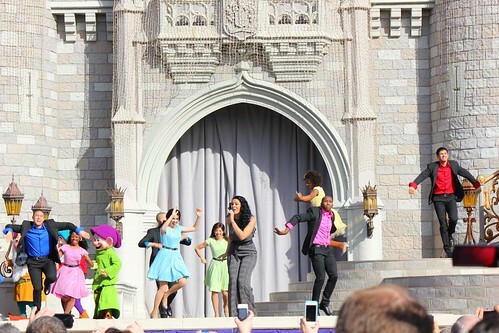 I just wish they had put Mickey in a better outfit, like in a Three Mouseketeers or Prince and Pauper color scheme. 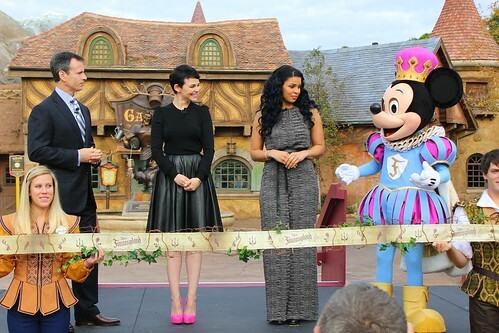 That color choice looks more appropriate for Minnie… Otherwise, this is flawless. Enchanted tales with belle is laaaaaame! Instead of a ride where animatronics could play all those roles they get the audience to “participate”. Sorry but when I visit a theme park i go to be entertained, not to be part of the show! I hope that garbage never makes it to Disneyland(CA) or any of the other disney parks for that matter. Walt Disney was designing better attractions than that 60 years ago! You understand that Enchanted Tales is for very little kids, right? If you are an adult going there without children then of course you might think it is “lame” as it’s not intended for you. Little kids have nothing like Enchanted Tales anywhere else…this and Storybook Circus are for them. Oh really? 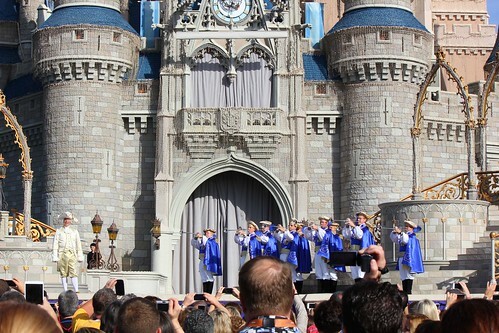 Then why did the cast members recruit several adults to participate in the “show”? And if you notice the role of maurice was originally a little girl, but then looks like her dad stepped in last minute to do it. The little girl was probably scared, or had no idea what was going on…ya great attraction for children. I feel sorry for the cast member who is pressed for time trying to explain everything and assign roles just for the little 2 minute story with belle. People can take their children to story time at their local libraries and get the same entertainment value as they get here. This is a lame attraction even for children. When I was a child I loooooved the original fantasyland dark rides. A beaauty and the beast dark ride would have been a hit with adults and children alike. Make no mistake, the only reason this lame “attraction” exists is because disney didn’t want to foot the bill for a ride. You’d be very naive to think otherwise. Seriously? The best thing about Disney parks is the diversity. Don’t get me wrong, I love the dark rides just as much as anyone, but if that was the only way Disney knew how to bring their animated movies to life, things wouldn’t be so special. Be glad the Imagineers (who by the way are Disney fans just like us) are willing to surprise us by which movies get the dark-ride treatment and which are being brought to life some other way. Besides, “Enchanted Tales with Belle” is much more entertaining than you are giving it credit for–kids actually don’t get that level of entertainment from a local library. Disneylands fantasyland has 8 rides based on the classic movies, small world, storybook boats, sleeping beauty walk through (in the castle) and even an e ticket (Matterhorn) and 0 storytelling attractions like this. So a park can be wildly successful without this type of attraction. Now reverse it and say that no rides existed and all the attractions were storytelling meet greet style attractions and how successful do you think that would be? Ya can’t really argue that right? Nobody would want to go there! The biggest let down however isn’t even that this attraction was built, but the fact that there is so much room behind be are guest and gastons to fit 3 or 4 haunted mansion sized show buildings! A big ride could have easily fit there, they just didn’t want to hit a home run like universal is doing nowadays with every chance they get. And that’s why so many Disney world fans are let down. Well of course there aren’t any storytelling rides like this at Disneyland–in fact, there aren’t any at any of the Disney parks. This was as much an experiment for Disney as it was anything else. Disney obviously wanted to try something new and see how people reacted to it. By now they’ve probably figured out that this is not the ideal “Beauty and the Beast” tribute for many and Disney will take that into account when designing future attractions for Disney movies. 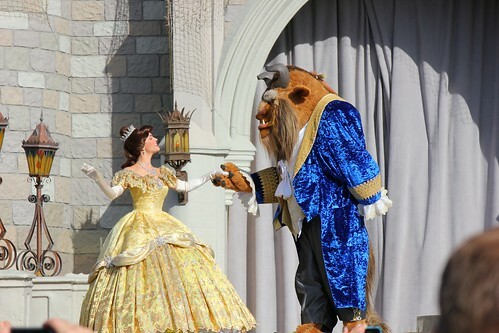 And I never said ALL attractions should be like “Enchanted Tales with Belle”. I just meant it added nice diversity to the park. Chaz, I didn’t say u said that. Read my post I’m simply pointing out the superiority of a ride vs this boring storytelling stuff, in terms of entertainment value. Disney is not experimenting here at all, they know exactly what they’re doing and as long as people flock to their resort they will not strive for the spectacular, not like universal is doing, sea world, or disneyland has done these last few years. That’s a big dissapointment for fans like me cause the culture of Disney was always to plus and do the spectacular regardless of how much the money was needed. That mentality brought amazing attractions like pirates, haunted mansion, Matterhorn and monorail. None of which Walt needed to do,Disneyland was already a huge success, he did it just because that’s what he lived for. I really hope WDW guest relations gets flooded with Where’s the ride? Letters from guests visiting new fantasyland. I don’t necessarily agree with all of what you said, but I can respect that it’s your opinion. So, agree to disagree? Ricky, thank you so much for all the work you have put into this! I live nowhere near Disney, and would never have been able to make it down to see this. It means so much to me to be able to take part in this amazing experience in the middle of studying for finals! 🙂 Just wanted to share my appreciation. Oh yeah! This is why I sometimes wish I lived in Florida. Running around is an understatement. An exhausting 3 days but so much fun! And yes, there’s no way I could keep up that pace every day. 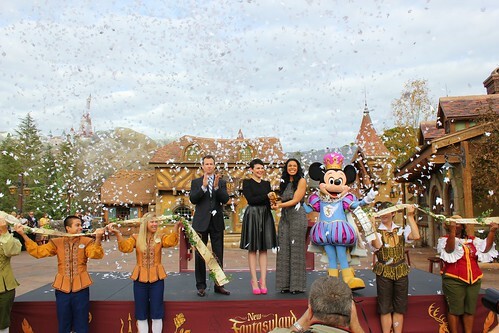 Does anyone know if the new Fantasyland will be open during the Christmas parties that are carried on after park hours? Just got home from being there. It’s amazing. Now I can read all your posts. Be our Guest was amazing. Mermaid was unreal. New things every time. We loved enchanted tales…my wife even got to be wardrobe!! so fun! which can wreck your business data and jeopardize your business. the Internet and that too without digging a hole in your pocket.